Click here for photos and more in the May 2018 magazine. When you see big crewed charter yachts breezing across the Bay, do you ever wonder what sort of people pay to sail on them? You may be surprised to learn that some charter guests are accomplished sailors who own their own boats. When occasions arise that require a passenger capacity or special amenities that your own boat just can't provide, you'll be relieved to know that the Greater Bay Area charter fleet contains a vast collection of boat types to meet the needs of almost any special occasion. A few examples are: wedding ceremonies or receptions, family reunion sails, corporate teambuilding events, milestone birthday parties, retirement parties, divorce celebrations, you name it. As you'll see in the following listings of large-capacity vessels there's a great variety of boat types to choose from, including traditionally rigged schooners, modern former race boats and flat-sailing catamarans. All are accessible to folks of all ages with no sailing skills required whatsoever, as their charter prices include the services of professional crew. That said, participation in some of the sailing chores is often encouraged. Bay Area charter boats vary in size from 20 to 50 feet, in comfort from stripped-out racers to comfy world cruisers, in performance from mellow daysailers to ULDBs, and in service from bareboat (sail-it-yourself) to fully crewed. We've attempted to be as comprehensive and up-to-date as possible in these listings. We regret any errors or omissions. Adventure Cat: This 55-ft catamaran was built specifically for chartering on SF Bay. One of the fastest local charters, she's been clocked at 20 knots. Guests can ride on the open-air trampoline, forward, or within the sheltered salon. •	Carries up to 48 passengers. •	Berthed at Pier 39, Dock J, in San Francisco. •	Available for scheduled sails daily (individually ticketed), private group charters, and special events, including weddings, whale watching and corporate programs. Adventure Cat 2: This 65-ft cat, like her older sister (above), is fast and fun, but can carry twice as many passengers. 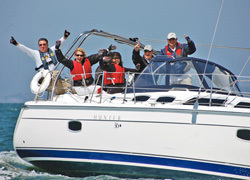 For really big groups, consider chartering both boats and sail together in tandem. •	Carries up to 90 passengers. •	Available forprivate group charters and special events, including weddings and corporate programs. 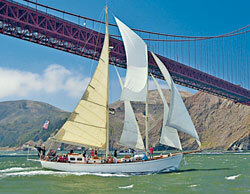 Argosy Venture:This 101-ft Nevins motorsailer also offers expeditions beyond the Golden Gate. Built as a private luxury yacht in 1947, her brightwork and period styling are an eye-catching sight when she roars across the Bay at 12 knots. •	Carries up to 12 passengers. •	Berthed at Brisbane Marina. •	Available for special custom charters locally (including corporate), family charters and expeditions, as well as film and dive charters. Bay Lady: At 90 feet in length, she is the largest Coast Guard 'certified' traditional sailing vessel on the West Coast. Built of steel for chartering, her design combines modern strength and safety featureswith an old-time sail plan. Guests are invited to participate in sailing this great schooner. •	Certified for 90 passengers (most comfortable with about 70-75). •	Berthed at South Beach Harbor, San Francisco (next to AT&T Ballpark). •	Private groups, weddings, celebrations, corporate offsites, Angel Island BBQs, baseball parties to McCovey Cove, some scheduled sailings (individually ticketed Brunch & Sunset Cruises). Bay Wolf: This pedigreed Santa Cruz 50 ocean racer is a veteran of many Hawaii and Mexico races. With her new mast, rigging and other upgrades, she promises fast, exhilarating Bay sailing. •	Certified to carry up to 24 passengers, but focuses on groups up to 18. •	Pickups in San Francisco and Sausalito. •	Available for private group charters, teambuilding, lessons, corporate charters, ash scattering or special events. Passenger participation highly encouraged. Cat Ballou: Originally a Caribbean charter yacht, this is a sweet-sailing Catana 42 catamaran. Chuck is a management consultant by trade, and specializes in teambuilding and private charters. •	Berthed at Schoonmaker Marina, Sausalito. •	Available for private group charters, special events and corporate charters, including teambuilding. Chardonnay II: This sleek Santa Cruz 70 is one of the most popular charters on Monterey Bay. Custom built for fast sailing, she offers a wide array of themed charters and corporate teambuilding. •	Carries up to 49 passengers. •	Berthed at Santa Cruz Harbor. •	Custom private charters, ash scattering, wine tasting, sunset cruising, corporate teambuilding. Club Nautique: Offering a wide range sized sail and power boats. Including pocket cruisers that range 31'-35' sail and 31'-37 single screw power. • Vessels are all pleasure yachts. As a result, all are restricted to 6 passengers. • Corporate Charters to help your organization heighten enthusiasm, forge successful teamwork and increase productivity. •	Custom private charters, ash scattering, wine tasting, sunset cruising, corporate team building. Derek M. Baylis: With a large rear deck and yacht-like living quarters, this 65-ft wishbone ketch provides a safe, comfortable, fast, and environment-friendly platform for fun corporate, recreational and educational cruises. •	Carries up to 35 passengers for day charters or 12 passengers for overnights. •	Berthed at Marina Bay in Richmond, CA. •	Available for day sails such as teambuilding and corporate events, individually ticketed celebrations, private parties, and marine education sails. Highly suitable for ocean charter and scientific voyages. 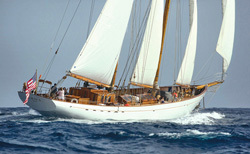 Eros: This exquisite 103-ft schooner was built in the UK in 1939 for aristocracy. A museum-quality restoration of her was recently completed, making her one of the Bay Area's most eye-catching yachts. •	Berthed at Sugar Dock, Santa Fe Channel, Richmond. •	Available for private group charters, special events including weddings and corporate events, and for long-term charters in the Pacific Northwest this coming summer. Freda B: 80-ft Luxury schooner built along the lines of traditional coastal schooners from the mid-1800's. Restored in Bristol fashion, with the creature comforts of a fine yacht: knowledgeable crew, flat screen TV, iPod compatible, excellent catering paired with Sonoma and Napa Valley wines. •	Carries: up to 49 passengers. •	Berthed: Sausalito Yacht Harbor. •	Available for: Private day charters including: Teambuilding, weddings/elopements, memorials birthdays, and custom special events. Individually ticketed sails available weekly February-November. Gas Light: This 72-ft schooner is a modern example of an 1874 SF Bay scow schooner. Exceptionally stable and comfortable, she boasts an 18’x30’ cabin and plenty of seating both above- and belowdecks. •	USCG certified for up to 49 passengers. •	Berthed: South Beach Harbor. 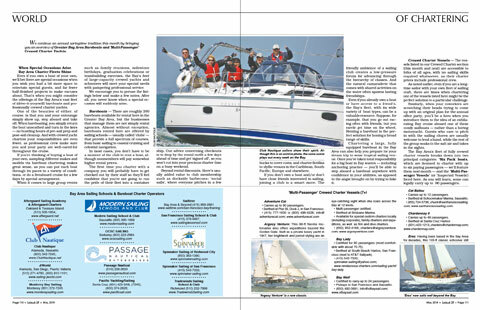 •	Available for private day sails, special events, corporate outings and teambuilding. Glory Days is a Morgan Out Island 51 staysail ketch. 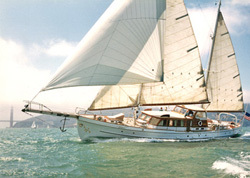 This luxury yacht is comfortable, fun and a great boat in the high winds of San Francisco Bay. •	Carries up to 42 passengers. •	Berthed at Pelican Harbor. •	Available for corporate teambuilding and private day sails, special events, individually ticketed scheduled sails, BBQ cruises to Angel Island, weddings and memorial ash scatterings. Just Dreaming: Rich deep teak and mahogany Gatsby-era yacht. Experience elegance from another era. Three staterooms, two heads (one with shower), full galley, and a luxurious main salon. Forward and aft decks allow plenty of space for socializing. •	Certified for 42 passengers and a crew. •	South Beach Harbor, San Francisco. •	Available for AT&T Park parties, birthdays, Bay cruises, weddings, rehearsal dinners, bachelor(ette) parties, networking events, reunions, holiday dinners, dolphin/whale watching, backwater California vacations, singles events. Nehemiah: This classic wooden ketch has circumnavigated twice, under previous owners. Solidly built and traditionally rigged, she is an ideal platform for pleasure sailing, as well as hands-on training, including “at-risk” youth sail training, the captain’s true passion. •	Carries up to 29 passengers. •	Berthed at D Dock, Richmond, Marina Bay, 2600 Spinnaker Way. •	Available for youth sail training, scheduled sails (individually ticketed) and private charters. Osprey: Gulfstar 50 ketch built for ocean cruising. Passengers enjoy ample deck space for sightseeing, stay high and dry in the center cockpit or enjoy the large salon. Luxury sailing. • Certified for up to 25 passengers, but focuses on groups up to 18. • Berthed at Jack London Square, Oakland. • Available for corporate teambuilding, birthdays, anniversaries, lessons and ash scattering charters. Passenger participation highly encouraged. Passage Nautical: Cruise the San Francisco bay onboard one of our new Beneteau sailing or power yachts, or Lagoon Catamarans. Bring your favorite food and beverages and set sail for a great day in the Bay! • Available for private groups, special occasions and corporate events. Privateer: This Islander Freeport 41 cutter has teak decks, finely varnished trim and many bronze fittings. Come see her mysterious stained glass. •	Certified for 28 passengers. •	Berthed at San Francisco's Pier 39. •	Specializes in scheduled 90-minute and 2-hour Bay sails (individually ticketed). Also available for private charters for all events and occasions. Will be sailing during every AC34 race day. Ruby: She started chartering in 1981 and proved her seaworthiness the next year by winning the Doublehanded Farallones Race. A veteran of cruises to Mexico, the Channel Islands and Delta, her skipper and crew have lots of party experience. •	Berthed at The Ramp Café, SF. •	Private parties and public sails. Santa Maria: Interestingly, this Islander Freeport 41 ketch was built for Wile E. Coyote cartoonist Chuck Jones. A complete refit was done on her in 2006, with a wall-to-wall teak interior. •	Certified for 36 passengers. •	Berthed at Pier 39. •	Offers private charter for all occasions, also match racing with the Privateer for team-building events. These are the only two identical inspected vessels on the Bay. Schooner Seaward: Owned by the nonprofit Call of the Sea. She sails during spring, summer and fall, with winter charters in Mexico. This lovely 82-ft staysail schooner’s primary function is Marine Environmental Education for Northern California students. We offer programs combining education, seamanship, marine environmental studies, and fun in the sun. •	Carries up to 40 passengers on day trips; 14 for overnights. •	Berthed at the Bay Model Pier in Sausalito. Free parking. •	Available for youth educational day sails, scheduled (individually ticketed) public sails, overnights to Drakes Bay and the Farallones, private group charters, corporate events, and 'adventure sailing' in Mexico during the winter. Tahoe Cruz: This Santa Cruz 50 sails daily out of the Tahoe City Marina with Tahoe Sailing Charters, with captains Mike and Tyler, from May to October. Prevailing SW afternoon breezes make for ideal sailing conditions. •	Certified for up to 30 passengers. •	Specializes in affordable and scenic 2-hour cruises with complimentary refreshments. Also available for private parties, company charters and Emerald Bay luncheon sails. •	Daily departures from Tahoe City Marina (home of Tahoe YC). Tahoe Dreamer: Enjoy a private charter aboard this 36ft. power catamaran. Cruising daily on three-hour tours of Emerald Bay from Tahoe City. Complimentary beer, wine, snacks and appetizers served on all charters. • Certified for up to 12 passengers. • Specializes in private scenic two-hour afternoon and sunset cruises and three-hour Emerald Bay charters. Available for private groups and company charters. Team O'Neill: O'Neill Yacht Charter's 65-ft catamaran is the ideal venue to experience the beauty and thrill of Monterey Bay for novices and seasoned sailors alike. •	Berthed at Santa Cruz Yacht Harbor. •	Public 1-hour, 1.5-hour and special event sails run May to October. Private charters available year-round. Wine tasting, live music, whale watching, afternoon and sunset sails. USA 76: 84-ft America's Cup IACC yacht that raced in the 2003 Louis Vuitton Cup in NZ. America’s Cup champion Brad Webb brought her to the Bay to share the thrills of pro racing in a rare, participatory experience. •	Carries up to 20 passengers. •	Berthed at Pier 39 in San Francisco. •	Available for 2.5-hour ticketed sails and custom private events. Yukon Jack: Check out the adrenal thrill of blasting across the Bay on this ultralight Santa Cruz 50. A former ocean racer, she once sailed from San Francisco to Tahiti in an impressive 19 days. •	Carries up to 25 passengers (most comfortable 16-18). •	Berthed at South Beach Harbor, San Francisco. •	Corporate offsites and our most popular Angel Island BBQ, Private group charters, weddings, celebrations. This feature was last updated on May 8, 2018. The story originally ran in the April 2017 issue of Latitude 38. To order a copy (complete with color photos), use the Individual Issue Order Form, and specify the 4/17 issue, or just drop us a note with a check for $7 to Latitude 38, Attn: Back Issues, 15 Locust Ave., Mill Valley, CA 94941. You can also see more back issues here.